Introduction Despite the importance of regular moderate-intensity to vigorous-intensity physical activity (MVPA) for health benefits and long-term weight management, current comprehensive lifestyle interventions have focused on providing MVPA prescriptions and goals but with only minimal and intermittent focus on psychosocial theoretical constructs and novel strategies, perhaps explaining the often modest impact on adoption and maintenance of higher levels of MVPA. An intervention based on acceptance and commitment therapy (ACT) targeting the increase of values-based autonomous motivation could improve the adoption and maintenance of habitual MVPA among insufficiently active overweight or obese adults in a brief intervention format. Methods and analysis The overall aim of this study is to develop and test the feasibility, acceptability and preliminary efficacy of an ACT-based brief workshop intervention for increasing bouted MVPA for inactive adults with overweight/obesity using a single-arm design. A total of 48 inactive adults with overweight/obesity will be recruited and attend a 4-hour, ACT-based workshop followed by weekly emails and monthly phone calls for 3 months. The workshop will teach values clarification and acceptance-based skills to increase values-based autonomous motivation and bouted MVPA. Participants will self-monitor minutes of MVPA and personal values and report on progress via weekly emails and monthly phone calls. Assessments will be conducted at baseline and at 3 and 6 months. Ethics and dissemination Study procedures have been approved by the Institutional Review Board. Consent is given in writing and in person. Data collection and storage separates study data from personally identifying information. Two safety officers who are not connected to the study monitor study progress and participant safety. Trial registration number NCT03565731; Pre-results. This study integrates two robust theories relevant to health behaviour change (self-determination theory, and acceptance and commitment therapy) to develop a novel physical activity intervention. This study develops a brief, versatile intervention that can be used as a stand-alone or add-on treatment. This study incorporates technology monitoring and objective assessment of moderate-intensity to vigorous-intensity physical activity. This study is limited by the lack of a comparison group. This study is limited by a relatively short timeline, precluding a test of the long-term impact of the intervention. Habitual moderate-intensity to vigorous-intensity physical activity (MVPA) performed in sustained bouts provides significant and wide-ranging health benefits1–4 and is a key factor in long-term weight control5 6; however, the impact of lifestyle intervention on MVPA is modest.7 For example, in the biggest lifestyle change intervention study to date, participants’ activity increased from 81 to 149 MVPA minutes in ≥10 min bouts (ie, bouted MVPA) per week on average over 1 year of intervention,8 with the majority of participants falling short of both the prescribed study goal (175 min per week) and the minimum recommendations (150 min per week),3 a finding consistent with other randomised controlled trials (RCTs).7 Thus far research has focused on providing MVPA prescriptions and goals but with only minimal and intermittent focus on psychosocial theoretical constructs and novel strategies to facilitate adoption and maintenance, suggesting there is potential for improving outcomes through targeted, smaller scale, theory-driven research. Consistent with self-determination theory (SDT),9 research suggests that motivation to engage in habitual physical activity (PA) varies to the degree to which it is experienced as autonomous, with higher autonomous motivation associated with greater habitual MVPA.10 Recently, Teixeira and colleagues10 conducted a systematic review of 66 studies using SDT and found strong evidence supporting the association between the presence of autonomous motivation and higher average levels of PA. Although there are different kinds of autonomous motivation, the review found that the strongest predictor of high, sustained levels of PA was engaging in PA because it was consistent with one’s personal values (referred to hereafter as ‘values-based autonomous motivation’). While SDT provides an excellent framework for understanding and identifying an important theory-based target (autonomous motivation), it does not provide validated treatment strategies for intervention. An intervention based on the newer generation behaviour therapy, acceptance and commitment therapy (ACT),11 is ideally suited to increase and maintain high levels of PA by fostering values-based autonomous motivation using values clarification and commitment strategies. The primary goal of ACT is to foster behaviour change consistent with one’s personal values (ie, autonomously motivated behaviour change).12 ACT uses values clarification strategies to help individuals identify how behaviours relate broadly to desired living for the individual. For example, increased PA can improve work performance, provide needed energy for parenting, improve intimacy, allow for engaging in desirable activities with friends or improve longevity for the purpose of witnessing family milestones, among many other possible values-based outcomes that can vary widely. ACT tailors values interventions to the individual, allowing them the autonomy of defining the purpose and degree of their behaviour change efforts. ACT also uses acceptance-based strategies to reduce cognitive and emotional barriers to engaging in values-consistent behaviour while undermining problematic sources of motivation (ie, non-autonomous motivators).12 ACT is a robust technology with broad support for producing meaningful behaviour change in a variety of mental and physical health-related problem domains12 and has shown promise in improving weight management13–15; however, it has not yet been carefully applied to PA. Therefore, the overall aim of this project is to develop and test the feasibility, acceptability and preliminary efficacy of an ACT-based workshop intervention for increasing bouted MVPA for overweight and obese, insufficiently active adults using a single-arm design. The primary goal of the workshop is to use values clarification and acceptance-based skills training to increase values-based autonomous motivation and bouted MVPA. If efficacious, the workshop intervention could be used both as a stand-alone intervention for inactive adults or as a component of a comprehensive weight loss or weight loss maintenance intervention. This project is a single-arm, open trial testing the feasibility, acceptability and preliminary efficacy of an ACT-based workshop intervention to increase habitual, bouted MVPA. The intervention is a one-time, 4-hour, face-to-face, group-based workshop followed by weekly emails and monthly support phone calls for 3 months. Each participant reports weekly via email on MVPA goal attainment and values awareness. Assessments are at baseline, 3 months and 6 months and include an objective measure of PA. Please see figure 1 for participant flow. All study procedures take place at the Weight Control and Diabetes Research Center (WCDRC) of The Miriam Hospital and Brown Medical School in Providence, Rhode Island, USA. Participants are recruited through advertisements in the local media (online and newspapers). Prospective participants who contact the WCDRC are screened by phone, attend an orientation session and then complete a baseline assessment. Participants who choose to participate after attending the orientation give written consent prior to completing the baseline assessment. The study plans to recruit a total of 48 participants, with the sample comprising at least 25% men and 20% from ethnic or racial minority groups. Body mass index between 25 and 35 kg/m2. Insufficiently active (ie, <150 min/week of MVPA). Unable to engage in PA safely due to medical status. Unable to read or understand study materials. Currently in another PA or weight control programme. Currently taking medications that cause dizziness or feeling faint while standing (eg, some hypertension medications). Any condition that would preclude adherence to the intervention protocol (eg, current or past substance use disorder or psychiatric hospitalisation). Plan to relocate during the study timeline. The ACT workshop is a 1-day, 4-hour, group-based intervention session delivered face to face in groups of 6–10. The use of ACT in a concentrated, workshop format is common, and has been shown to be effective and is one of the potential advantages of using such an approach.12 The intervention is delivered by a PhD clinical psychologist with extensive training in the development and delivery of interventions based on ACT for health behaviour change. The basic structure is an initial onsite, group-based intervention workshop, written materials, weekly emails, and monthly phone calls for a total of 3 months. The workshop is designed to increase values-based autonomous motivation in order to increase bouted MVPA. Participants engage in basic and advanced values clarification exercises designed to help clarify (1) the relative importance of major values domains (eg, social, vocational, recreational) and (2) the potential role of PA in empowering functioning in these domains. Participants generate their own PA goals and additional values-based goals by identifying activities that will impact important, personally identified valued domains. For example, a participant might strongly value parenting, and thus might set a goal for increased activity participation with their children (which would be a target on its own, but also is related to their PA goals by increasing energy level). In addition, acceptance strategies are taught to reduce cognitive and emotional barriers to meeting values-based goals. The delivery of ACT is experiential in nature, with frequent processing of thoughts and emotions. Finally, participants receive a FitBit Flex as part of the intervention, which is an activity-tracking device wristband to monitor their PA goal progress via the free FitBit app. See table 1 for detailed intervention content. Treatment fidelity will be assessed by a PhD-level psychologist trained in both ACT and PA intervention development by reviewing a randomly selected 10% of workshops. Following the workshop, participants receive 12 weekly emails. Each email contains a survey of the following: (1) What was your exercise goal for the past week (total number of minutes)? (2) How many minutes did you exercise in the past week (total number of minutes)? (3) To what degree were you aware of your values in relation to exercise in the past week? Each weekly email also contains a micro-intervention to support skills learnt in the workshop. Micro-interventions focus on the importance of connecting PA to personally stated values, applying acceptance-based skills in the presence of cognitive and emotional barriers, and supportive feedback. See box 1 for an example. This week, take 10 minutes to simply write about why exercising matters to you. It’s not important what you write, only that you write for 10 minutes (or more if you want). Some ideas to prompt you, how does exercising enable you to accomplish more in your life? Or to improve your relationships? Or to allow you to participate in desired activities? Do this within the next 24 hours OR schedule a specific time and day to do it to minimize the chances you will forget. Monthly phone calls are brief (20 min or less), semistructured, and designed to review key principles (eg, commitment to values-consistent behaviour, acceptance skills) and troubleshoot specific barriers identified by the participant. Assessments occur at baseline and at 3 and 6 months. At each assessment visit, participants complete questionnaires and are administered an ActiGraph activity monitor to wear for seven consecutive days. All questionnaire data are collected using scanned forms. Participants receive a $25 honorarium to compensate them for their time. Demographics will be assessed at baseline only and will include gender, race, ethnic background, education level and household income level. 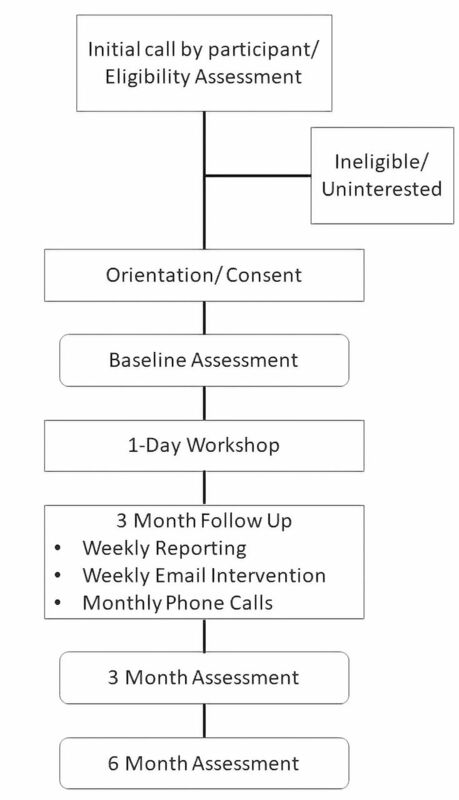 Following guidelines of previous studies, we assess feasibility and acceptability first by examining study completion rate (completion ≥70% of email surveys and intervention phone calls), and retention at the 6-month study endpoint assessment visit. We also use an adapted, 15-item version of a previous validated feasibility and acceptability measure for PA interventions with a 5-point Likert scale (1=‘don’t agree at all’ to 5=‘totally agree’).16 17 Item examples will include the following: ‘I enjoyed participating in the intervention’, ‘I think the intervention strategies were appropriate’ and ‘I found the lessons to be easy to understand’. The average daily minutes spent in objectively measured, bouted MVPA is the outcome of interest, as per public health guidelines.20 Participants’ daily time spent in bouted MVPA is measured via an ActiGraph device (ActiGraph, Pensacola, Florida, USA). This device employs a rigorously validated triaxial accelerometer and proprietary data filtering technology to reliably estimate free-living PA in adult populations.21–23 Data from the ActiGraph are processed using the most recent version of ActiGraph’s ActiLife software. Raw data will be processed using the low-frequency extension filter and integrated into 60 s epochs. Time spent in bouted MVPA will be determined using previously published and validated cut points (≥1952 counts per minute accumulated in bouts of ≥10 min).24 Participants are asked to wear the monitor during all waking hours, exclusive of bathing and swimming, for seven consecutive days at each assessment period. For each of the 7-day assessments, a participant’s data are considered valid if he or she wore the device for ≥10 hours on ≥5 days (including ≥1 weekend day). Intensity of PA is assessed as average count per minute. On returning the ActiGraph, participants are asked whether their 7-day period of assessment was representative of their usual level of activity, and if not are asked to provide context (eg, injury, illness). Treatment fidelity will be assessed via a four-item coding form that assesses (1) the degree of consistency with the content of the written protocol, (2) the presence of ACT elements, (3) the presence of SDT elements and (4) the presence of elements inconsistent with ACT and SDT. Participants were not involved in the development of the research question, design of the study or recruitment process. Burden of assessment is not assessed; however, open feedback is solicited at study end. Results will be disseminated (summary of main outcomes) to any participant who requests after the study ends. The sample size was chosen in order to obtain reliable and precise estimates of treatment effect that are sufficient for determining whether continuation of the research (ie, refinement of the intervention for testing in a large-scale RCT) is justified. Based on prior studies with insufficiently active adults, we anticipate that participants will have a baseline mean of roughly 75 min of bouted MVPA. The intervention aims for ≥200 min of objectively measured bouted MVPA to achieve a mean of >150 min per week, which is considered a clinically significant level of MVPA. Assuming an SD of approximately 150 min (as seen in prior studies) and a sample size of 48, the 95% CI around a true mean of 200 min would be 150–250 min. Therefore, if we achieve a mean of at least 150 min at study endpoint (6 months), we will consider the intervention to be minimally clinically significant and sufficiently efficacious to warrant further development and then testing in a larger scale. Generalised linear models will be estimated using generalised estimating equations (GEE) with robust SE estimate, which provides an extension of regression analysis to the case of correlated or repeated observations and allows for appropriate modelling of covariance structures when observations are correlated across time. Mean and error parameters generated by GEE will be used to calculate effect size. We will use the same GEE analysis method to calculate estimated marginal mean change in MVPA. The same GEE procedure will be used to examine change in CompACT and SRQ-E scores. The intervention will be considered feasible and acceptable if (1) we achieve an average of ≥70% completion on both email surveys and phone calls (indicating completion of the 3-month programme); (2) we achieve ≥70% retention at the follow-up assessment (6 months); and (3) the item score on the feasibility and acceptability questionnaire at post-treatment (3 months) is ≥4.0, with ≥70% of recorded responses indicating ‘somewhat agree’ or ‘totally agree’. This study has significance because the ACT intervention could produce high, sustained levels of MVPA in a brief, workshop format. ACT can have a significant impact on behaviour and health outcomes when administered in brief, concentrated doses,13 25–27 and the use of a workshop format has the potential to improve cost-effectiveness and portability. Prospective participants initiate contact with the study in response to advertisements. The study is described to individuals via telephone and then in more detail in a face-to-face orientation session. Interested and eligible participants sign a consent form approved by the Institutional Review Board of The Miriam Hospital at the orientation session. Participant data confidentiality is protected through a multitiered approach, including data collection, data transmission, data handling and data distribution processes, to ensure anonymity both during and after the study. Participant information collected by the research staff contains only a non-identifiable study identification (ID). A separate form linking study ID and participant identifiers (name, address, contact names and addresses) is maintained in a locked file. Two PhD-level researchers have agreed to be safety officers for this trial. One is an exercise physiologist, the other a psychologist, both with extensive experience in the conduct of clinical trials related to weight and PA. Tables indicating our progress with recruitment, retention at assessment sessions, reasons for dropouts and adverse events will be submitted to the safety officers for their review at 6-month intervals throughout the trial. After reviewing the data, the safety officers will indicate in writing whether the study is progressing appropriately or changes are needed. At any point during the trial, the safety officers can recommend that a phone call be held to discuss any issues with the progress or safety of the trial, or recommend contacting the funding agency. We thank Kevin O’Leary and Krystal DeFaria for their excellent work coordinating recruitment and assessment meetings for the study.
. Four-year physical activity levels among intervention participants with type 2 diabetes Medicine & Science in Sports and Exercise in press.
. Acceptance and commitment therapy: an experiential approach to behavior change. New York: The Guilford Press, 1999. Contributors Both coauthors contributed to all phases of the study, including initial idea, grant proposal preparation, study administration and manuscript preparation. JL wrote the initial draft of the manuscript. DSB provided extensive comments/feedback for improving the manuscript as well as specific intext changes. JL completed the final submitted version of the manuscript based on DSB’s revisions and suggestions. Funding This study is funded by the National Institute of Diabetes and Digestive and Kidney Diseases (R03 DK114254). Ethics approval This study has been approved by the Institutional Review Board of The Miriam Hospital.